Jones, E.J. (2017). Autism. In B. Hopkins & R. G. Barr (Eds. ), The Cambridge encyclopedia of child development. (2nd ed.). [Online]. Cambridge: Cambridge University Press. Available from: https://search.credoreference.com/content/topic/autism [Accessed 25 April 2019]. Jones, Emily J.H. "Autism." Cambridge Encyclopedia of Child Development, edited by Brian Hopkins, and Ronald G. Barr, Cambridge University Press, 2nd edition, 2017. Credo Reference, https://search.credoreference.com/content/topic/autism. Accessed 25 Apr. 2019. Disorder, usually first appearing in early childhood, characterized by a withdrawal from social behaviour, communication difficulties and ritualistic behaviour. Autistic people have difficulty understanding themselves or others as agents with varying beliefs and desires. The causes of autism may originate in genetics, brain damage or psychology. Autism spectrum disorder (ASD) is a neurodevelopmental disorder characterized by difficulties with social communication and the presence of restrictive interests, repetitive behaviors, and sensory symptoms, according to DSM-5. Symptoms must be apparent from early childhood for a diagnosis to be made. ASD is three to four times more common in boys than girls, although this likely represents a combination of biological differences and under-identification of girls in community settings. The name ‘autism spectrum disorder’ reflects the huge variability in the degree and nature of the symptoms that people with ASD experience. Indeed, some people refer to the ‘autisms,’ because they believe that ASD is an umbrella term for a number of separate conditions. While some people with ASD never live independently, have a job or form strong peer relationships, others can have highly successful professional and personal lives. One challenge for many people with ASD is the presence of associated conditions such as attention deficit hyperactivity disorder (ADHD), anxiety, depression, intellectual disability, or developmental coordination disorder (DCD). Many researchers seek to understand the causes of ASD in order to develop new intervention strategies for those in need. However, it is important to recognize that many individuals with ASD have significant strengths. It is important to balance a celebration of ‘neurodiversity’ with developing treatment options for individuals who face more significant challenges to their quality of life. In this entry, the behavioral, cognitive, and neurobiological phenotypes of ASD are reviewed, focusing on core domains such as social cognition, executive functioning, and perceptual processing. Next, our emerging understanding of the very early developmental trajectory of symptoms of ASD is considered, and current knowledge on genetic and environmental risk factors is reviewed. Finally, progress and prospects for early screening, diagnosis, and intervention are discussed. ASD is a behaviorally defined disorder recognized when a child shows a set of delays or deficits in both social communication (e.g., limited non-verbal gestures, atypical eye contact or body language) and social interaction (e.g., reduced social approach, conversational reciprocity or sharing of interests and emotions, and difficulty forming peer relationships), and restricted repetitive patterns of behavior, interests or activities (e.g., stereotyped speech or repetitive use of objects, excessive adherence to routines or difficulty with change, restricted interests, and hyper- or hypo-reactivity to sensory input or unusual sensory interests). To make a diagnosis, symptoms have to impair everyday functioning. Typically, ASD is diagnosed by a pediatrician or clinician using observational semi-structured assessments (e.g., Autism Diagnostic Observation Schedule) in which the individual interacts with an unfamiliar adult, with a detailed developmental history being taken from a caregiver. Faces carry critically important information about identity, feeling, and intentions. Many children with ASD show difficulties in both processing and remembering information from faces. For example, toddlers with ASD show slower early neural responses to face pictures as measured by electroencephalography (EEG) (Webb et al., 2011). A recent randomized control trial of an early intensive intervention for toddlers with ASD showed that neural correlates of attention engagement with faces can be significantly improved such that children with ASD resemble those with typical development (Dawson et al., 2012). In this study, children received up to 20 hours per week of one-to-one therapy with a trained interventionist, using the Early Start Denver Model (ESDM). This is a developmentally informed treatment and curriculum that addresses all developmental domains, using teaching strategies based on applied behavior analysis. Importantly, neural engagement to faces versus objects in the group who received ESDM were correlated with social communication skills (Figure 1). Further elucidating the relationship between face-processing deficits and general social communication delays is an important question for future work. For example, face-processing speed correlates with everyday social skills in 18- to 42-month-old toddlers with ASD (Webb et al., 2011). Reduced interest in other people early in development could prevent experience-based learning about faces, which in turn contributes to face-processing and recognition difficulties in later development. Alternatively, difficulty in processing information from faces could make it difficult for children with ASD to learn about the social world. Further work in this area is required to understand the importance of face-processing deficits in ASD. Figure 1. Relation between EEG responses to faces versus objects and change in social communication skills on the Pervasive Developmental Disorders Behavioral Inventory (PDDBI) in children who received early intensive intervention for ASD. Greater theta power and less alpha power reflects greater engagement. Dawson et al. (2012). Early behavioral intervention is associated with normalized brain activity in young children with autism. Journal of the American Academy of Child and Adolescent Psychiatry, 51, 1150-1159.
. Copyright (2012), with permission from Elsevier. Children with ASD are known to have difficulty understanding the thoughts and intentions of other people. This has been described as a ‘theory of mind’ deficit. Recent work has established that the ability to attribute goals and intentions to other people emerges in early infancy. For example, 2-year-olds who watch a video of a person who is unaware that an object has been moved from Box A to Box B anticipate that the person will search for the object in Box A. However, much older children with ASD do not show this ‘implicit’ theory of mind ability, even though they may pass explicit versions of these tasks (Senju et al., 2010). Children with ASD can also appear to lack the motivation to engage in social interaction. For example, young children with ASD may fail to orient to social cues like their mother's voice or a person entering the room. The resulting reduction in exposure to social experiences could alter the progressive specialization of the brain, leading to a broad range of socio-communicative impairments. Such accounts suggest that restrictive interests or repetitive behaviors emerge downstream in development as a replacement for social activity. However, this perspective is challenged by the fact that repetitive behaviors emerge at a similar age to social deficits (Jones, Gliga, Bedford, Charman, & Johnson, 2014). The ‘social brain’ is a network of regions that support behaviors related to social interaction and communication. For example, brain regions like the superior temporal sulcus (STS) are involved in processing information about eye gaze and body movement. An impairment in STS functioning could affect the development of skills like imitation, gaze shifting, and gesture production. Indeed, recent work with an optical imaging technique called near-infrared spectroscopy (NIRS) suggests that infants at high familial risk for developing autism do not show typical specialization of superior temporal lobe responses to social stimuli, which may be consistent with this view (Lloyd-Fox et al., 2013). However, it will be important to explore the relation between such responses and later ASD diagnosis in order to fully evaluate this hypothesis. Executive functioning (EF) refers to a suite of abilities mediated by the frontal cortex that includes inhibition, working memory, set-shifting, and planning. There is considerable evidence that EF is impaired in at least a proportion of children with ASD (Johnson, 2012). However, the suggestion that EF may be a ‘primary’ impairment (viz., one that causes other symptoms) has not been broadly supported. First, deficits in EF are found in children with other clinical disorders like ADHD, and are thus not specific to ASD. Second, very young children with ASD show similar levels of EF to those with other developmental delays. This suggests that EF difficulties might be related to general cognitive development, rather than the core symptoms of ASD. Finally, EF deficits are not ‘universal,’ that is, they are not present in all children with ASD. Rather, EF might act as a general protective factor that ‘buffers’ development against risk factors for a range of poor neurodevelopmental outcomes (Johnson, 2012). Examining the effects of interventions that target EF in early development in children at risk for a range of disorders could be a powerful approach. People with ASD often focus on small local details rather than global patterns. For example, many individuals with ASD are better at spotting small changes in sounds or patterns, or working out how to fit different blocks together to make a particular shape. This focus also applies to social cognition: Those with ASD may focus on the individual features in a face, rather than its global structure. While some researchers have described these observations as impairments in global processing or ‘weak central coherence,’ others prefer to describe them as ‘enhanced perceptual functioning.’ By this view, individuals with ASD perceive perceptual information more ‘accurately’ (i.e., in a way that is less influenced by prior expectations about the world). Neurocomputational models of top-down versus bottom-up processing hold great promise for rigorously testing theories of alterations in perceptual style in ASD. It is also important to consider the way in which such differences are framed (as deficits or differences), a debate that has both conceptual and societal importance. Sensory hypo- (under) or hyper- (over) responsiveness has recently been added to the diagnostic criteria for ASD. Children with ASD may find sensory stimuli aversive, or may seem unaware of their environment. The same child may show hyper- and hypo-sensitivity in different contexts or across different sensory modalities. Little is known about the source of such difficulties. One possible contributing factor may be that children with ASD have particular difficulty in binding together multisensory stimuli (e.g., stimuli that have both visual and auditory dimensions). The inclusion of sensory sensitivities in the new DSM-5 criteria is likely to lead to a substantial increase in research in this area. Motor difficulties are also common in ASD. Some children with ASD have difficulty with motor planning (e.g., preparing the next movement in a sequence), and in creating smooth sequenced movements (such that movements can appear to be jerky). Indeed, subtle motor delays may be one of the earliest signs of ASD. For example, 6-month-old infants with later ASD may show poor neck control (such that their head is not maintained in line with their body when they are pulled to sit), and subtle delays in reaching and grasping (Flanagan, Landa, Bhat, & Bauman, 2012). Abnormalities in the cerebellum (a brain structure critical to motor control) have also been observed in ASD. However, there remains debate over whether motor impairments are specific to ASD, or whether they are associated with more general developmental delays. Alterations in structural and functional connectivity between different brain regions have been widely described in ASD. Many studies with adults report under-connectivity across measures of structural connectivity (e.g., diffusion tensor imaging) and functional imaging (e.g., fMRI, EEG). This lack of connectivity could compromise communication between different brain regions, making complex abilities like social communication more difficult. However, there is intriguing evidence to suggest that young children with ASD may show increased connectivity (Plate 13). This may contribute to the overgrowth in brain size and head circumference that appears to occur in the first and second years of life for children with ASD. These findings highlight the importance of examining ASD across development. Plate 13. Increased EEG connectivity (warm colors) in infants at high familial risk for ASD (HR-ASD) relative to infants with an older sibling with typical development (LR) or high-risk infants who did not develop ASD (HR-no-ASD). Orekhova, E.V. ; Elsabbagh, M.; Jones, E.J.H. ; Dawson, G.; Charman, T.; Johnson, M.H. the BASIS Team (2014). EEG hyperconnectivity in high-risk infants is associated with later autism. Journal of Neurodevelopmental Disorders, 6, 40.
. With permission from BioMed Central. Nerve cells communicate through endogenous chemicals that transfer information across the synapse. These neurotransmitters and neuromodulators include GABA, serotonin, dopamine, and norepinephrine. Although all the neurotransmitter systems have been implicated in ASD, evidence appears to be converging on the possibility that an imbalance between inhibitory and excitatory systems is one causal route to ASD (Rubenstein & Merzenich, 2003). The GABA-ergic and glutamergic systems are critical in maintaining the appropriate inhibition/excitation balance for normal brain function. Disruptions in this balance in ASD could account for the substantial co-morbidity with epilepsy, which is associated with ‘over-excitation.’ This inhibition/excitation imbalance would also affect the onset and duration of sensitive and critical periods in early development, which could compromise normal adaptive brain development. Studying the emergence of symptoms of ASD requires prospective longitudinal studies from infancy through early childhood. Recently, researchers have begun to conduct prospective longitudinal studies of infants with older siblings with ASD. These infants have around a 20 percent risk of meeting criteria for ASD at age 3 years; an additional 20 percent of infants have other developmental difficulties. Data collected in the infancy period can be examined in relation to ASD ‘outcome’ to identify changes in behavior, cognition, and brain activity over time (Jones et al., 2014). This work helps to identify early signs of ASD that could be used in screening, and to characterize the developmental mechanisms that drive symptom emergence. Studies of ‘infant siblings’ have revealed that behavioral symptoms of ASD emerge gradually over the first three years of life. At 6 months, infants with later ASD are often highly sociable, and smile and look at researchers as often as typically developing infants. However, as a group, infants with later ASD gradually fall behind in their communication skills and draw away from social interaction between 6 and 18 months (Ozonoff et al., 2010). Where detailed analyses of developmental trajectories have been conducted, infants with later ASD fall into different sub-groups. About half show early symptoms (e.g., clear presentation of ASD symptoms that emerge between 6 and 14 months), while the other half develop more typically through the first year, but then start to show accumulating difficulties (developmental decelerations) in the second and third years. Other children may experience periods of frank regression, associated with loss of language, social, or other skills that were previously stable. Experimental methods have revealed that despite apparently typical social behaviors in the first months of life, there may be underlying neurocognitive alterations. For example, high-intensity eye tracking has shown that infants with later ASD look more at people's eyes at 2 months than typically developing infants (Jones & Klin, 2013). Furthermore, 7-month-old infants with later ASD show a diminished EEG (Figure 2) response to shifts in eye gaze (toward and away from the infant; Elsabbagh et al. 2012). Future research is required to identify whether these early developmental paths are shared by ‘simplex’ cases of ASD, those that appear in the absence of any family history of the condition or its symptomatology. Figure 2. 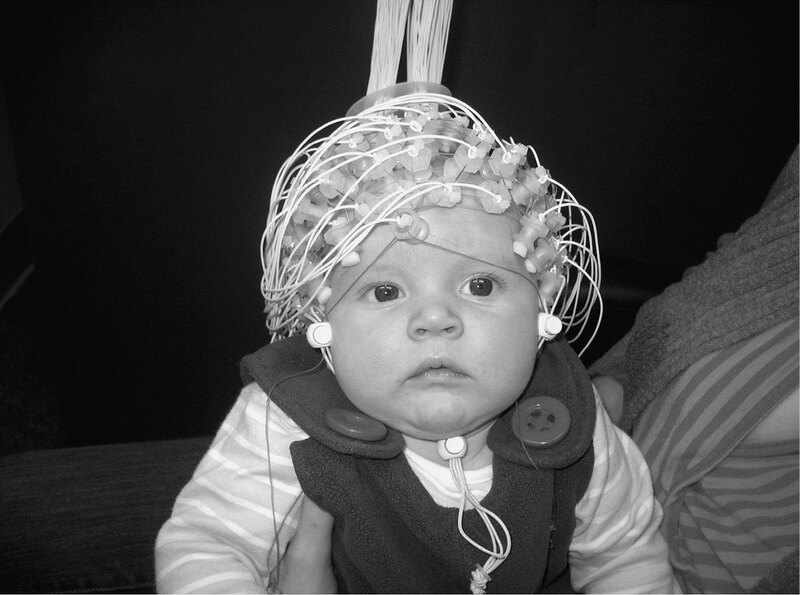 Infant wearing an electroencephalography cap. Symptoms of ASD are related to the interplay between multiple genetic and environmental risk factors. The majority of risk for ASD appears related to possessing a certain number or combination of common genetic variants (Gaugler et al., 2014). Common variants are changes in the sequence of a gene that are found in a substantial proportion of the population, and alone they have very minor effects. For example, one common variant that has been linked with ASD is a single nucleotide polymorphism called rs1718101 that occurs in the contactin-associated protein-like 2 (CNTNAP2) gene, a member of the neurexin family that controls axonal differentiation and guidance. Other cases of ASD may be related to single de novo (non-inherited) mutations, which include alterations in the number of copies of particular genes (‘copy number variations’). For example, duplications of the 15q11-13 region and deletions of the 16p11.2 region are the two most commonly observed copy number variations, although they account for only a small percentage of cases each. De novo mutations appear to be more common in non-familial (simplex) ASD, in females, and in males with low IQ. Other cases of ASD are associated with specific genetic syndromes like fragile X or neurofibromatosis. Researchers are now trying to identify how the multitude of genetic risk factors cluster into core molecular pathways, because this will be critical to identifying particular targets for pharmacological intervention. In addition, epigenetic control of gene expression is of increasing interest. Considering the developmental timing of genetic disruptions will also be critical. For example, more severe forms of ASD may be related to alterations in genes that are most active in early prenatal development (Parikshak et al., 2013). Environmental risk factors also contribute to a significant number of cases (Sandin et al., 2014). Most identified risk factors act prenatally or very early in the postnatal period (Persico & Merelli, 2014). For example, maternal infection by agents such as rubella or cytomegalovirus, and exposure to teratogenic drugs like valproate during pregnancy, are associated with two to eight times the risk for later ASD diagnosis. Others have suggested that altered hormonal levels during pregnancy (e.g., elevated levels of fetal testosterone) may also play a role. It is likely that environmental and genetic risk factors interact to produce ASD risk. For example, GABA-ergic signaling typically shifts to an inhibitory function on a temporary basis around the time of birth, triggered by oxytocin. This reduces excitatory function, protecting the developing brain against brief periods of hypoxia during the birthing process. If genetic mutations prevent this process from occurring, infants may be more susceptible to the effects of oxygen deprivation during pregnancy or birth, contributing to ASD risk (Tyzio et al., 2014). Early development is a time of significant neuroplasticity, and mounting evidence indicates that early intervention for ASD can have a significant impact on development, functioning, and quality of life. While pharmacological treatments are available for some of the associated difficulties children with ASD can face (e.g., ADHD symptoms, anxiety and depression, or aggression), no pharmacological treatments have been shown to be effective at treating the core symptoms of the disorder. Currently, the best available evidence supports the use of comprehensive behavioral and developmental therapies. Appropriate intervention strategies for children with ASD involve curricula with a focus on social attention, imitation, receptive and expressive language, appropriate play, and social interaction. Teaching environments need to be highly supportive and build in generalization strategies. For example, children should be taught skills in multiple contexts, and parents should be encouraged to take similar approaches to create a more pervasive experience for the child. Predictability and routine is critical, and a functional approach is taken to problem behaviors. Such work recognizes that children with ASD may require different learning environments from typically developing children, and these environments should be provided as soon as symptoms of ASD are recognized. Autism research is a fast-moving, interdisciplinary area. We have made significant progress in identifying the genetic and environmental causes of autism and are starting to understand the developmental pathways through which those causes lead to behavioral symptoms. Clinical work has established that early intervention approaches can lead to significant gains for young children with ASD. Looking to the future, we must tackle the challenge of the substantial overlap between different neurodevelopmental disorders. Most individuals with ASD have one or more co-occurring disorders, and symptoms that resemble those seen in ASD are common in those with other conditions. The genetic and environmental risk factors and the early developmental signs of ASD are shared with many other disorders. Future work must move from examining particular diagnostic categories to understanding the neurocognitive systems that influence early neurodevelopmental trajectories across a range of disorders. New frameworks for understanding mental health (e.g., Research Domain Criteria) will be powerful tools in this endeavor. Eye tracking; Magnetic resonance imaging (MRI); Functional near-infrared spectroscopy; Direct observational methods; Connectionist modeling; Executive functions; Longitudinal and cross-sectional designs; Attention; Cognitive development during infancy; Cognitive development beyond infancy; Executive functions; Face perception and recognition; Intelligence; Joint attention; Social development; Selfhood; Socialization; Theory of mind; Brain and behavioral development; Cognitive neuroscience; Social neuroscience; Resilience and vulnerability; Classification of developmental disorders and diseases; Behavioral and learning disorders; Attentional deficit hyperactivity syndrome; Childhood epilepsy; Developmental coordination disorder; Fragile X syndrome; Behavioral genetics; Connectomics; Developmental genetics; Systems neuroscience; Whither developmental intervention? Dawson, G.; Bernier, R. (2013). A quarter century of progress on the early detection and treatment of autism spectrum disorder. Development and Psychopathology, 25, 1455-1472. Ecker, C.; Spooren, W.; Murphy, D.G.M. (2012). Translational approaches to the biology of autism: False dawn or new era? Molecular Psychiatry 18, 435-442. Johnson, M.J.; Jones, E.J.H. ; Gliga, T. (2015). Brain adaptation and alternative developmental trajectories. Development and Psychopathology, 27, 425-442. Wass, S.V. (2011). Distortions and disconnections: Disrupted brain connectivity in ASD. Brain and Cognition, 75, 18-28. Webb, S.J. ; Jones, E.J.H. ; Kelly, J.; Dawson, G. (2014). The motivation for very early intervention in infants at high risk for autism spectrum disorders. International Journal of Speech-Language Pathology, 16, 36-42. Dawson, G.; Jones, E.J. ; Merkle, K.; Venema, K.; Lowy, R.; Faja, S.; Webb, S.J. (2012). Early behavioral intervention is associated with normalized brain activity in young children with autism. Journal of the American Academy of Child & Adolescent Psychiatry, 5, 1150-1159. Elsabbagh, M.; Mercure, E.; Hudry, K.; Chandler, S.; Pasco, G.; Charman, T.; Johnson, M.H. (2012). Infant neural sensitivity to dynamic eye gaze is associated with later emerging autism. Current Biology, 22, 338-342. Flanagan, J.E. ; Landa, R.; Bhat, A.; Bauman, M. (2012). Head lag in infants at risk for autism: A preliminary study. American Journal of Occupational Therapy, 66, 577-585. Gaugler, T.; Klei, L.; Sanders, S.J. ; Bodea, C.A. ; Goldberg, A.P. ; Lee, A.B. ; Buxbaum, J.D. (2014). Most genetic risk for autism resides with common variation. Nature Genetics, 46, 881-885. Johnson, M.H. (2012). Executive function and developmental disorders: The flip side of the coin. Trends in Cognitive Sciences, 16, 454-457. Jones, E.J. ; Gliga, T.; Bedford, R.; Charman, T.; Johnson, M.H. (2014). Developmental pathways to autism: A review of prospective studies of infants at risk. Neuroscience & Biobehavioral Reviews, 39, 1-33. Jones, W.; Klin, A. (2013). Attention to eyes is present but in decline in 2-6-month-old infants later diagnosed with autism. Nature, 504, 427-431. Lloyd-Fox, S.; Blasi, A.; Elwell, C.E. ; Charman, T.; Murphy, D.; Johnson, M.H. (2013). Reduced neural sensitivity to social stimuli in infants at risk for autism. Proceedings of the Royal Society B: Biological Sciences, 280, 20123026. Ozonoff, S.; Iosif, A.M.; Baguio, F.; Cook, I.C. ; Hill, M.M. ; Hutman, T.; Young, G.S. (2010). A prospective study of the emergence of early behavioral signs of autism. Journal of the American Academy of Child & Adolescent Psychiatry, 49, 256-266. Parikshak, N.N. ; Luo, R.; Zhang, A.; Won, H.; Lowe, J.K.; Chandran, V.; Geschwind, D.H. (2013). Integrative functional genomic analyses implicate specific molecular pathways and circuits in autism. Cell, 155, 1008-1021. Persico, A.M.; Merelli, S. (2014). Environmental factors in the onset of autism spectrum disorder. Current Developmental Disorders Reports, 1, 8-19. Rubenstein, J.L.R. ; Merzenich, M.M. (2003). Model of autism: Increased ratio of excitation/inhibition in key neural systems. Genes, Brain and Behavior, 2, 255-267. Sandin, S.; Lichtenstein, P.; Kuja-Halkola, R.; Larsson, H.; Hultman, C.M. ; Reichenberg, A. (2014). The familial risk of autism. Journal of the American Medical Association, 311, 1770-1777. Senju, A.; Southgate, V.; Miura, Y.; Matsui, T.; Hasgawa, T.; Tojo, Y.; Csibra, G. (2010). Absence of spontaneous action anticipation by false belief attribution in children with autism spectrum disorder. Development and Psychopathology, 22, 353-360. Tyzio, R.; Nardou, R.; Ferrari, D.C.; Tsintsadze, T.; Shahrokhi, A.; Eftekhari, S.; Ben-Ari, Y. (2014). Oxytocin-mediated GABA inhibition during delivery attenuates autism pathogenesis in rodent offspring. Science, 7, 675-679. Webb, S.J. ; Jones, E.J.H. ; Merkle, K.; Venema, K.; Greenson, J.; Murias, M.; Dawson, G. (2011). Developmental change in the ERP responses to familiar faces in toddlers with autism spectrum disorders versus typical development. Child Development, 82, 1868-1886. Obsessive-compulsive disorder is a chronic, disabling anxiety disorder characterized by intrusive, persistent thoughts and repetitive behaviors.